Sport Clips Santa Maria believes in putting our values in action, which includes giving back to our local communities. In order to accomplish this, we are involved with multiple charitable organizations to do our part in enhancing the lives of others. 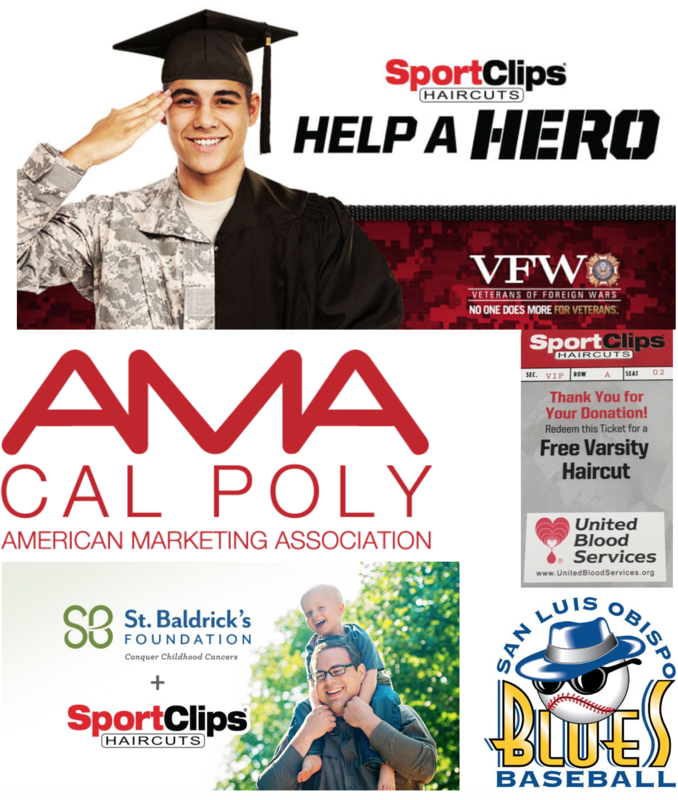 → To support and honor our nation’s heroes, Sport Clips Santa Maria annually raises funds for the Veterans of Foreign War’s (VFW) Sport Clips Help A Hero Scholarship program. These funds provide scholarships for returning servicemen and women for use at both post-secondary schools & trade schools to ease the transition back into civilian life. To date, Sport Clips has raised over $1.2 million in scholarships to active-duty service members and veterans. → We serve as the primary sponsor of the Ageless Aviation Dreams Foundation, which provides “flights of a lifetime” to WWII and Korean War veterans. Additionally, for the past four years, we have thanked our veterans by participating in a "Stand Down" event hosted by Santa Barbara County in which we donate free haircuts to veterans. → We support United Blood Services in their efforts to collect life-saving blood and platelet donations by providing free haircuts to donors as thank you for their commitment to the life-saving mission that United Blood Services upholds. In addition, we support those suffering from cancer by donating free haircuts to those who wish to donate their hair through Pantene's Great Lengths program that is run through Relay for Life, a walk to raise money for research on a cure for cancer. → We believe in supporting the future leaders of America and to achieve this, we donate money to the American Marketing Association club on the California Polytechnic State University, San Luis Obispo's campus. These funds are used to finance meetings where students who are interested in the field of marketing and business are provided the tools and tips needed to create a successful career and future. → We also support the San Luis Obispo Blue’s Baseball organization in their efforts to mentor and advance the professional and physical skills of collegiate baseball players in their pursuit of a career in Major League Baseball. We donate MVP Haircut gift certificates to this cause to be raffled off to raise funds for this organization.